For me a visual reference helps keep my mind in focus and really feel and experience what I’m writing about. Previously in my Constructing a Character Pt.1 I showed ways of finding inspiration. 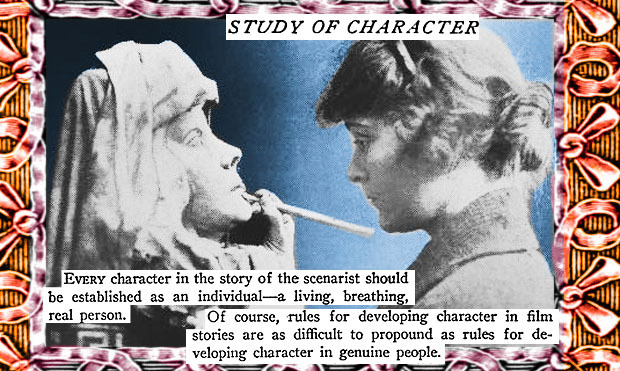 Now I’ll show you another way to approach constructing a character for your film or short story. The above image would usually come about when I’m sitting around playing with a theme in my mind. This character theme could be “everyday people with superpowers” or something like that. Then I branch off to the first thing that comes to mind, for me it was a girl in a red dress wearing blue converse sitting alone at a bar. I quickly sketch that out and from there play with other concepts. A pyrokinetic with an odd fashion sense. Then from there I imagine a few ways we could introduce her to the audience along with her powers. The sketches aren’t meant to be storyboard quality. It’s just one of my methods of brainstorming. Just like someone might have a book of ideas written down I find the things I do are a combination of both. Rough sketches of characters along side key points about them. This kind of process is useful if you have a little bit of an artistic or design background. I do and that’s why I really like this approach. If you don’t feel like sketching but still are very much a visual thinker and like to see your ideas try a little Photoshop magic. Use Adobe Photoshop and Google Image to stitch together a scene or character. That way you have a visual reference you can easily share with others. In the above image I can start brainstorming about her backstory, where she’s from and the obstacles she encounters in the story. Adobe also has a free mobile and iPad app Adobe Photoshop Mix that helps you easily cut up and create a collage from images you capture on your phone. There is never a single way to expressing this mysterious power called creativity. Sketch out your characters, or write a journal pretending to be them, make collages or act them out. Find ways to express your story through words or through images, whatever you choose, have fun with it!